Super Bowl 52: There's Nothing Super About It! New England vs. Philadelphia. Could it get any worse? As a fan of the New York Giants, these are the 31st and 32nd teams on my list of favorite NFL teams. And to have them playing each other in the final NFL game of the 2017-18 NFL season, it just figures. This season was an interesting one. The aforementioned NY Giants finished a season, which started with Super Bowl aspirations, with the second worst record in the NFL. We lost franchise QBs Aaron Rodgers, Carson Wentz and Andrew Luck to injury. The Cleveland Browns lost all 16 games, only covering the spread in 4 out of 12. That was a trend that reverberated throughout the league. Starting in week 4, favorites covered the spread at a ridiculous rate. With the exception of minor corrections throughout the season, Vegas couldn’t make the lines high enough. No matter what, the favorites covered and it hurt the sports books. Don’t worry about them, I’m pretty sure they’ll endure. And now, we come to Super Bowl 52, the final game of the NFL season. Last year, $138MM was bet in Vegas on the Super Bowl. That’s amazing amount of money wagered on one football game. Will it be exceeded this year? Hard to tell, but if you’re in Vegas you can bet that prop. Seriously, you can bet on whether or not the total amount of money wagered on the Super Bowl is over/under $138MM. Since 2009, the total amount wagered on the Super Bowl has exceeded the previous year with the exception of 2015. So the over is 8-1 in the past 9 years, just saying. It’s also a good indicator of who at your Super Bowl party is a degenerate gambler when you see them in the corner with one on their phone’s timer. Seriously, Pink! I know the proper spelling in P!nk but I refuse to acknowledge that in my writing. Did you hear that Ke$ha? Fade the over, four of the last five anthems lasted over 2 minutes. What color will Pink’s hair be for the national anthem? This is really on the board. I’m not giving the odds because if you bet this you’ve got serious problems. Apparently Pink is a huge Eagles fan. Green is 5-1 if you must. Always remember, tails never fails. Sure we all remember Nipplegate. But that was 2004. JT is back for halftime, but Janet is not. Given the #metoo climate in our country right now, Al Michaels stay far away from any mentions. Take the under. It’s a trap. Prince is from Minneapolis and he passed away last year, this is too obvious. Wow, just a yes or no. Not even a line on this one. Of course he will be mentioned. He’ll be mentioned more times than any other President has been during the Super Bowl and it’ll do HUGE things for the ratings. The mention will be worth it for the tweets alone. Ah, this will go over. Especially if his name gets mentioned. Then he can take credit for making the Super Bowl great again. And if a player kneels during the national anthem, this goes waaaaayyyy over. Too bad the game is not on ESPN/ABC. They would go over the 5 by kick-off. Still, it’ll go over. This seems like an easy win for “no”, especially in a competitive game. But it happens more often than you think. “Yes” is the bet. If you think the Pats win the game, bet Brady. If you think the Eagles win the game, bet Foles. Our pick: Jake Elliott +5000. We could go on and on with props and we might revisit them in a Super Bowl part II post. Don’t hold your breath waiting for that one – odds on it actually happening are -185. Back to the game. Our goals this year are to watch as little of this actual football game as possible, win a few prop bets, drink some beers, enjoy the commercials, eat too much, drink more beers and win a square or two. Between the Super Bowl parties, the half-time show and the commercials, does anyone actually watch the game? Not usually and definitely not this year unless you are from Boston or Philadelphia. But this game will happen and either the Pats repeat as Super Bowl champions or the Eagles win the first Super Bowl in team history. We vote for C – none of the above. The Patriots opened as 6.5 point favorites and the line move down quickly. It has settled at Pats by 4.5. New England definitely has the experience on its side as well as an advantage at head coach and quarterback. Aside from quarterback, Philadelphia has more weapons on offense and a very good offensive line. On defense, the Eagles definitely have the advantage over the Patriots. The Eagles D line puts a lot of pressure on the QB and forces a lot of mistakes and turnovers. Brady may be the best QB of all time, but we think he struggles early and doesn’t have enough juice for another miracle comeback. The game will be close and relatively low-scoring until the 4th quarter. Our guess is it’ll be 23-23 in the 4th before Jake Elliott kicks the game winner from 53 yards out. 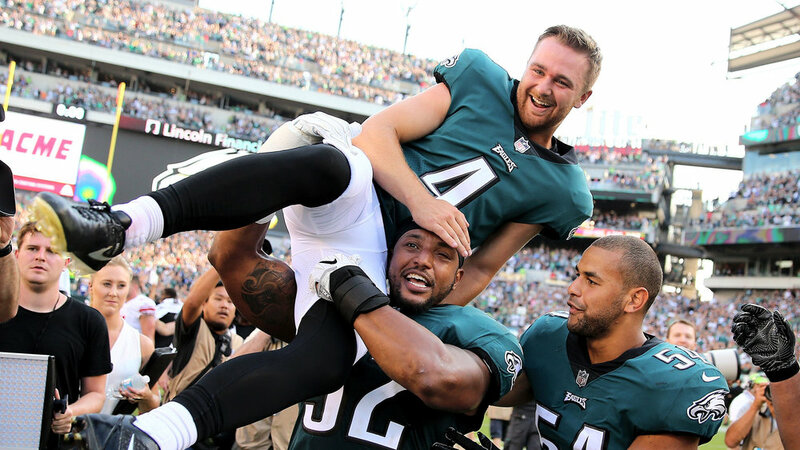 Eagles win outright 26-23 and Jake Elliott gets to go to Disney World.